Seville, capital of the Andalusia region in southern Spain, is home to just under 700,000 people. Famous for the graceful, traditional Flamenco dance, Seville also boasts beautiful architecture from the 18th century and the Moorish Almohad dynasty. Popular touristic sites include Alcázar of Seville, which is a majestic royal palace, and the beautiful Plaza de España. Cheap flights to Seville are now available for a limited period of time, so prepare to be whisked away by this city’s beauty and incredible history! Seville is home to Seville Airport (SVQ) which is a 10-minute drive from the city centre. SVQ serves a multitude of airlines that include Iberia, Lufthansa, Swiss Airlines and TAP Portugal. Affordable flights to Seville depart from Cape Town and Johannesburg. Flight duration from Johannesburg to Seville is approximately 13 hours and 45 minutes. 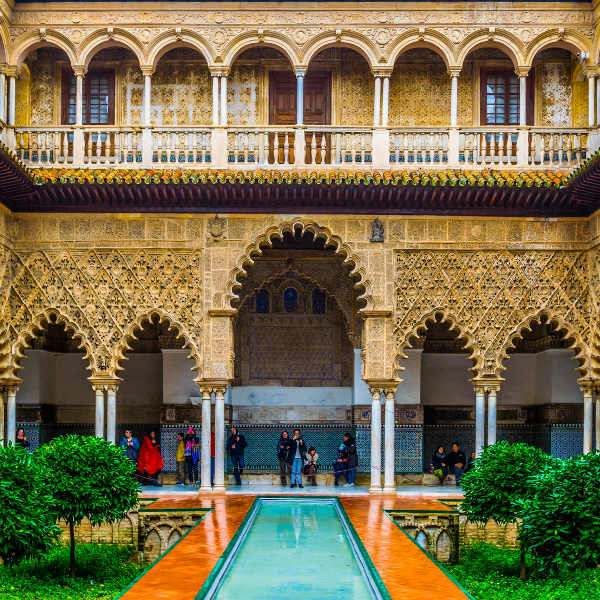 Explore the ancient, yet beautiful and majestic royal palace, Alcázar of Seville. As one of the oldest and most beautiful attractions, it fills the city with magical wonder. 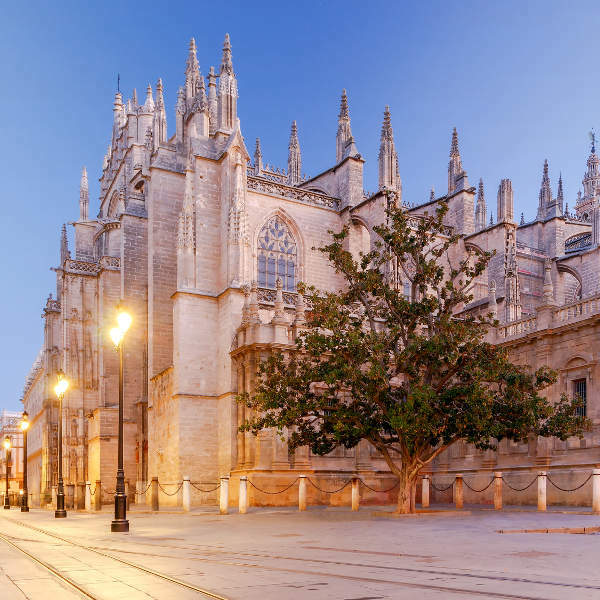 Located in the heart of the city, the magnificent Cathedral of Seville stands tall as the largest Gothic styled cathedral and the third largest cathedral in the world. 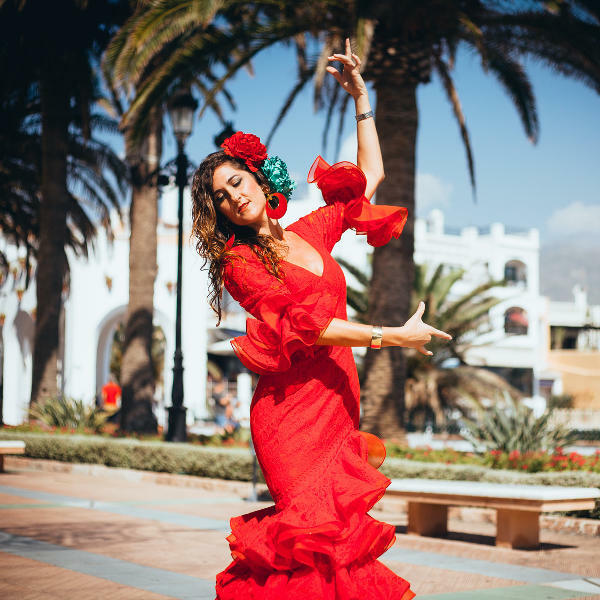 Learn the beautiful style, forms and steps of the traditional Flamenco dance that Seville, and other cities in southern Spain, have intrigued the world with since the 1700s. Seville is the sunniest and warmest city in Europe with its sub-tropical Mediterranean climate. Summer stretches from May to October. The beautiful spring season in March and April and general summer season are the peak tourist periods in Seville. In spring, the aromatic scent of the azahar citrus flowers fills the air and pleasant temperatures makes sight-seeing and attending festivals an unforgettable experience. Admire the Semana Santa holy festival processions in March or dance and party at the annual Seville April fair that flamboyantly celebrates Flamenco dancing. July and August are the hottest months in the city and due to the high temperatures, these months are low travel periods in Seville. Less crowded streets will allow you to roam leisurely through the city and enjoy a more authentic and unique experience of the local culture. Flights, accommodation and other holiday rates are also much lower during this period. Enjoy the colourful Corpus Christi festival in May, or take a trip to the Triana district where you can learn the traditional Flamenco dance from the locals. Seville, an ancient gem situated on the banks of the Guadalquivir River in southern Spain, captivates visitors with its unrivalled city views, magical history and unique culture. Renowned for the enticing and graceful traditional Flamenco dance, Seville also boasts beautiful architecture from the 18th century and the Moorish Almohad dynasty. Walk through the beautiful and majestic royal palace, Alcázar of Seville, which is a UNESCO World Heritage Site and one of the most beautiful attractions in the city. Wonder awaits at the Plaza de España that showcases Regionalism Architecture at its best or stand in awe of the Cathedral of Seville, the largest Gothic-styled and third largest cathedral in the world. After a long day of discovery, try some of Seville’s vast variety of ‘tapas’. Enjoy a tasty portion of spicy potatoes, or a sip of the local beer, Cruzcampo, offered at one of the many restaurants and bars in the city centre. Seville has a vibrant nightlife and the Alfalfa district is one of the many districts that promises nights of non-stop partying. It is popular with local students and has a large variety of bars and clubs to explore, giving this destination an edge to its well-rounded holiday experience. Compare several airlines and book your cheap flights to Seville online at Travelstart! South Africans do require a Schengen Visa to enter Spain. The Embassy of Spain in South Africa can be found at 337 Brooklyn Road, Brooklyn in Pretoria. Make sure your routine vaccines that include the MMR vaccine, DPT, Chickenpox, Polio and yearly flu shots are updated before travel. Vaccines for Hepatitis A and B could be considered but are not required. Seville is a fairly safe city, however, you should still practice normal safety precautions such as keeping your valuables and important documentation safe and watching out for petty crimes like bag-snatching or pick-pocketing.